« Liberals in Nazi Clothing? “Sisters and brothers…I’m an Islamaphobe’s worse nightmare.” It’s moving rhetoric to instantly want people, especially feminists, to separate themselves from the bad Islamaphobes, who are presumed to exist, and evoke sympathy for a brave Sarsour as under dog in need of rescue from the bad people. One of Sarsour’s tweets from last week was particularly artful, and so I put Sarsour’s tweeting lips to the test. 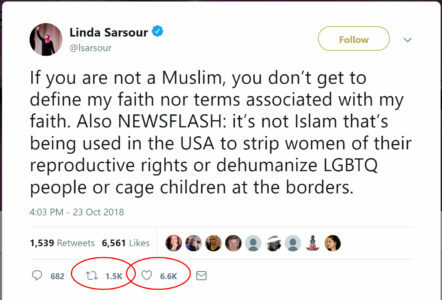 Here is her tweet, and as you can see, she got well over 6,000 likes; and, based on the comments people were believing and liking what she was saying. By implication she was saying: Judeo-Christian America is a human rights violator, and Islam is not, so side with Islam. 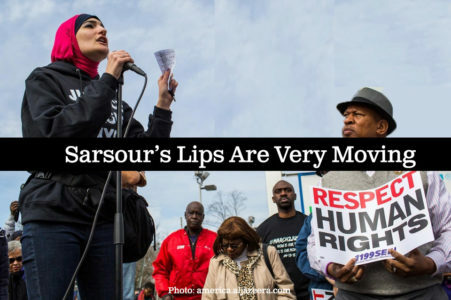 When you stop and think about it, Sarsour’s statement is not only untrue, but actually absurd, and the research supports just that. The Truth: It is exactly Islam that almost completely strips women of their reproductive rights. Sarsour’s statement implies that Judeo-Christian North America does not allow abortion, but Islam’s Sharia Law does. The truth is that Judeo-Christian North America has some of the most liberal abortion laws in the world with entire organizations supporting abortion, like Planned Parenthood. In Islamic countries where many women can’t even vote or leave the house without the permission of their husband, it would seem highly unusual if Islam had liberal abortion laws. It does not. 18 of 47 Muslim-majority countries only permit abortions in cases where the life of the pregnant women is threatened (Table 4)…However, notably, all Muslim countries allow abortions to save a woman’s life, i.e. in no country is there a zero count. 2. Sarsour: “it’s not Islam that’s…dehumanizing LGBTQ people”. The Truth: it’s only Islamic countries that dehumanize LGBTQ people by having the death penalty for homosexuality. In Judeo-Christian North America we have the most liberal laws (rightly) protecting LGBTQ even from harmful speech, much less the death penalty. In contrast, it is Islamic Sharia Law countries in which the penalty for homosexuality is death. This Article has equally put the emphasis on the disastrous effects of “traditional” interpretations of Sharia Law for both LGBT individuals (marginalization, exclusion, prostitution, drug use, high number of suicides) and the global population’s health…. 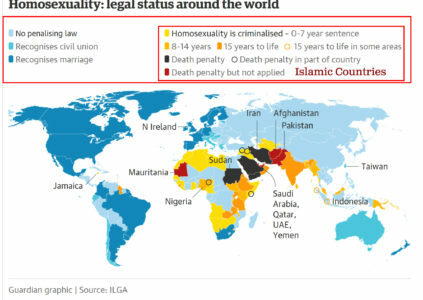 Today, seven Islamic states (namely, Saudi Arabia, Iran, Sudan, Yemen, Mauritania, and Nigeria) apply the death penalty against homosexuals and in some instances against young persons or juveniles. As this Article has demonstrated, however, these initiatives are often subject to political pressure, mainly between the “West” (particularly the United States) and the OIC. The soft law on the matter is not at the slightest taken into account by OIC [Organization of Islamic Cooperation] member states, and the Yogyakarta principles are certainly an optimistic, but not sufficient, step to impose on Muslim-majority and Sharia compliant states an end to the repression of queerness and discrimination against LGBT individuals. The Truth: it is exactly Islam, even moderate Islamic Egypt, whose standard practice is to “cage” or jail children of illegal border crossers. There were some children at the US border that were held in barred containment areas that could be referred to as “cages”. However, it was time limited. The majority of illegal border crossers’ children at the US border were placed in accommodations with schools, beauty parlours, and yoga classes, etc. Egypt has long been a destination and transit country for refugees, asylum seekers, and migrants from across the Middle East and Africa. Its Mediterranean coast has served as an important staging point for people attempting to reach Europe irregularly. Observers have repeatedly expressed concerns about Egypt’s use of police stations and prisons for immigration detention purposes. Despite on-going government repression of civil society organisations and the dire conditions migrants face in detention, Egypt remains a key EU partner in Mediterranean migration control policies. Its repeated crackdowns on irregular flows along its borders have led to higher rates of detentions and deportations. Linda Sarsour’s speechs may be very moving, but if you see her lips moving check the facts before you submit to her statements about Islam and Sharia Law. This entry was posted in Islamic Activism, Sharia Law in Canada, Liberalism-Socialism-Communism, Religious Freedom and Christianity, Think Over News and tagged abortion, globalism, homosexuality, islamization, judeo-christian, law, lgbtq, Liberals, linda sarsour, reproductive rights, sharia law.